Carl Vollrath is an American composer of German parentage. He studied with Ernst von Dohnanyi, Carlisle Floyd and John Boda. 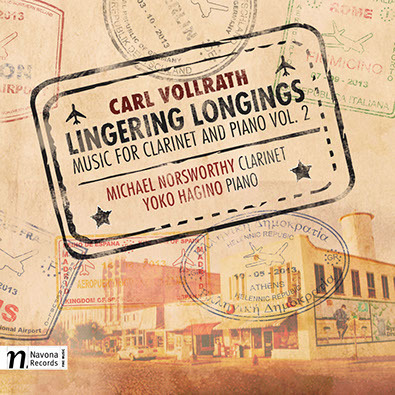 This disc from Navona Records, Lingering Longings, is volume two of Vollrath's music for clarinet and piano. 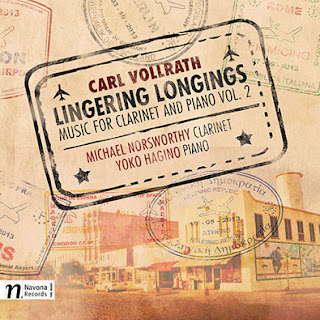 On this disc Michael Norsworthy (clarinet) and Yoko Hagino (piano) perform Tim and Tina's Ball, The Odd Pieces, Trina's Path, Once in a bygone time, Lingering Longings and Evan's Haven. Vollrath's music includes six symphonies for ban, an opera The Quest, and a substantial body of chamber music. I have to confess that this is the first time I have come across Vollrath's music. He was a very definite voice, tonal but rather expressionist, able to write memorable melodies yet not do the obvious. Jazz and blues seem to thread their way through the disc, as do hints of Shostakovich and Hindemith, and more than once I head echoes of Prokofiev's Overture on Hebrew themes. But none of this is pastiche, Vollrath's personal voice blends them all. All the music on the disc is testament to Vollrath's friendship with Tom and Trina Phillips (both clarinettists) and many of the movements are character pieces evoking moments from this friendships. Tim and Trina's Ball is four short pieces depicting early moments from the friendship. Christmas Time is touching and rather wistful, Wedding Waltz is faster yet evocative, Kaspar on parade is spiky and its edgier moments hint at Shostakovich. The last movement, Thanksgiven is thoughtful and elegiac, with the intensity towards the end evoking the music of Gerald Finzi. Vollrath describes The Odd Pieces as eight movements each about an imaginary fairy-like picture of a young mind. Teddy bear's big feet dance is darkly perky (with Prokofiev's Hebrew themes in the background), Wicked witches having fun continues the mood and gets slightly disturbing. Midnight waltz is lyrically expressionist whilst Cat and mouse ball combines jazzy rhythms with edgy harmonies. Gaby with green eyes has a quietly intense clarinet with more impressionistic piano comments. A slight romance seems more structured, with the romantic piano part getting hauntingly thoughtful. Goodnight waltz is rather elegiac whilst the final movement, Saber prancing is rather dramatic with undertones of Shostakovich. Trina's Path was written for Trina Phillips to show off her technical and musical capabilities. Vollrath describes it as one long crescendo. Starting from quiet rich harmonies, the pieces moves through intense romantic moments to a march like theme which is developed with some complexity. Once a bygone time attempts to capture the essence of a small rural town like Troy, Alabama (Vollrath joined the Troy University faculty in 1965 and retired last year). The opening has a meandering yet intense clarinet part which leads us through a variety of different tempos and styles. Lingering Longings, about remembering past times, is a quiet bluesy piece. The final piece on the disc, Evan's Haven, was composed for Tom Phillips who wanted a companion piece to Vollrath's Little Violet, when his young son was born. It is a perky piece with jazz hints and melancholy moments. Whilst I enjoyed the disc immensely, it is perhaps a recital to drop into rather than listen end to end.. Too many of the pieces have similar evocative atmospheres, and there were moments when the different movements seemed to form a continuum rather than individual pieces. The performances from Michael Norsworthy and Yoko Hagino are completely admirably and they perform the music with great love.